What I remember the most in November since I had been living in Chartres is the weather... rain and wind almost all of the days! It's autumn! Yes I know... until today I still keep searching for the best place for autumn foliage picture shot in the city. 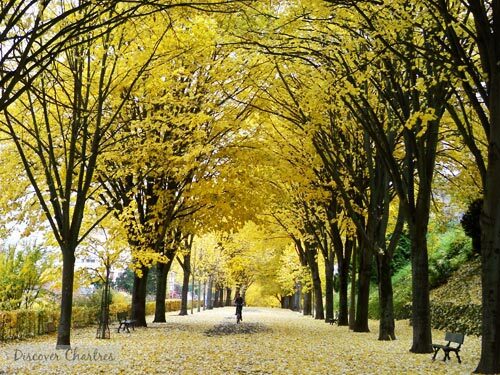 My favorite is the autumn tunnel of Butte des Charbonniers. You should go there in early season before the wind blows down all the yellow gold color leaves. Do you know other nice places in the region for autumn foliage? Do let me know! November 7, Opération Roméo, theater, Théâtre de l'Imprévu - admission: adult - 25€, under 12 - 10€. November 14, Mesonges d'Etats, theater with Samuel Le Bihan - admission: adult - 37€, under 12 - 15€. November 20, Lavilliers en Concert, music, Bernard Lavilliers - admission: adult - 37€, under 12 - 15€. 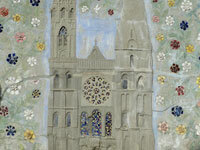 November 22, Musique Classique Revisitée, music, Mozart Group - admission: adult - 25€, under 12 - 10€. November 25, Le Neveu de Rameau, theater, Diderot - admission: adult - 25€, under 12 - 10€. November 28, Oblomov, theater, by La Troupe de La Comédie-Française - admission: adult - 37€, under 12 - 15€. 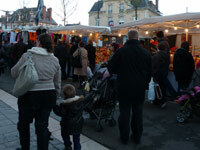 Traditional commercial market and cultural to celebrate St. Andrew's day, known to locals as la Foire de la Saint André. Numbers of merchants are ready to welcome visitors at market stands along the principal streets in Chartres. Enjoy your Sunday of St. Andrew's day by shopping or simply strolling down the city to discover various products like art and craft, culinary, garments and entertainments for kids.